Tells the story of Patti and Jenn, who were united by their sons and brothers going to war, September 7, 2009 By Midwest Book Review (Oregon, WI USA) Something in common unites many, but when war is involved, that union is even stronger. "Friends for Life: Strangers Brought Together by the War in Iraq" tells the story of Patti and Jenn, who were united by their sons and brothers going to war. Having little else in common, the two women developed a bond through it all, and they give readers a positive message. "Friends for Life" is something to be considered by all relatives of military people. Cuyahoga Falls native Patti Donahue met Jennifer MackInday on the Internet, but they weren't on a dating site, nor were they job seekers. In Friends for Life: Strangers Brought Together by the War in Iraq, the women tell of the e-mail correspondence they began through an Internet bulletin board for families of soldiers in an infantry regiment called Deuce Four. Donahue's son Jon, a medic, and MackInday's brother, James, who drove a Stryker combat vehicle, were deployed to Iraq in 2004 to suppress insurgency in Mosul. They witnessed the suicide bombing of a mess tent near a U.S. airfield in Marez, and James was later injured when his vehicle ran over an improvised explosive device. The book prints texts of conversations between the men and their relatives, describing food and equipment shortages and discussing the 2004 election. The section about the process of mailing packages is interesting and may encourage readers to send items themselves (there are tips and addresses in an appendix). The authors have taken a challenging format and found a workable solution: MackInday's contributions are in regular print, Donahue's in italics, texts of e-mails in bold; this provides clarity without excessive explanation. Friends for Life provides insight into the lives of soldiers on the front and their supportive, anxious families. The 222-page softcover costs $15.95 from http://www.sandyislandpress.com. Patti Donahue lives in Amado, Ariz., and in Ontario, Canada; MackInday lives in Indiana. You Served Radio airs live each Thursday at 1800 Central. “You Served” is a leading weblog focused on the Military and Veterans community. Listen to Jennifer's Interview on Talk Radio Portal with host Mojoe of Talk Radio. The show covers current events and the military. Author Jennifer MackInday interviewed on WTIU's Weekly Special hosted by Ann Shea. KVOA Tucson Interview with author, Patti Donahue. The One-Minute How-To Podcast Episode #363, How to Honor Our Soldiers and Veterans, is now available for listeners online. During the interview, author Jennifer MackInday shared numerous ways anyone can honor service members and veterans. The show, produced by George Smythe, has won several awards and reaches thousands of subscribers. May 25, 2009 - Memorial Day is the perfect time for your family to show appreciation for the sacrifices America's service members and their families. Taking time as a family to honor our military will make memories that last a lifetime. There are several easy ways to get involved. Start by phoning your local American Legion Post and volunteer to help place flags on military graves or assist with a Memorial Day ceremony. Organizations such as the American Legion rely completely on volunteers to make Memorial Day Celebrations successful. You can find a local phone number for the American Legion Post nearest you in the phone book, or visit the American Legion Online. Another great way to get your family involved is by writing letters to soldiers. Everyone in the family can write their own letters, or the family can write one letter together. If you don't know a soldier to write to, Soldiers' Angels and A Million Thanks will connect you. Taking time to write soldiers in combat can make a soldier feel appreciated and your family feel rewarded. This will also give your children an opportunity to practice their writing skills and show their concern for others and our country. Every combat soldier appreciates letters and packages from home, even if they are sent by a stranger. Make a new military friend and lasting family memories by assembling a care package for a member of the armed forces serving overseas. Find item suggestions and connect with a soldier through Operation Gratitude or AnySoldier. Care packages don't have to cost a lot of money. Choose items you can afford and pack your box with love. Include your contact information so that the receiving soldier will have the opportunity to return the correspondence. Memorial weekend is the perfect time to have a yard sale. This year, donate part or all of your profits to a worthy organization that supports our military and their families. Make signs so your customers will know just how your family is helping to make a difference for our veterans. Have the kids sell lemonade and cookies for the cause and get everyone involved. Some worthy organizations to consider for your donation are The Fisher House, The Intrepid Fallen Heroes Fund, and Operation Homefront. May 18, 2009, Tucson, AZ -Good Morning Tucson'sKimberly Romo interviewed Patti in the KGUN studio today. Patti told viewers how they can support our troops and gave military families deployment survival tips. May 17, 2009, Bloomington, IN - A new nonfiction war story, told through the voice of two women chronicling the experiences and emotions of a yearlong deployment to Iraq, is now available. 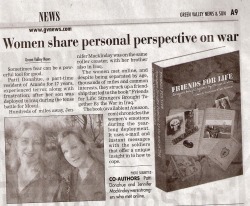 “Friends for Life: Strangers Brought Together by the War in Iraq” by Jennifer Mackinday and Patti Donahue, is available for sale directly from the authors’ Web site, www.friendsforlifebook.weebly.com, and at www.amazon.com. Patti, mother of Army medic Jon, and Jennifer, sister of infantry soldier James, forge a friendship online and join forces to support their soldiers and comfort each other. Though the two women were separated by miles, age and interests, they were drawn together by shared terror and the desire to communicate with and comfort their soldiers. Co-author Jennier Mackinday lives in Bloomington with her husband and son. May 11, 2009 - Co-authors Jennifer MackInday and Patti Donahue wrote the true store of how supporting soldiers in wartime connected two people in a special way. Entitled Friends for Life: Strangers Brought Together by the War in Iraq, the book follows two women as they go through the deployment of a loved one. Once they connect on the Internet, they are drawn together by their desire to communicate with and comfort their soldiers. The book goes on sale May 19 and includes a section of resources for people to forge their own special connections across the miles. Soldiers' Angels is listed as a resource both in the book and its accompanying website. Soldiers' Angels is honored to be highlighted by these fine authors and proud to stand with people who make the world a better place with their words and actions. Bloomington, Indiana, May 10, 2009 – A new non-fiction war story told through the voice of two women chronicling the experiences and emotions of a yearlong deployment to Iraq. Patti, the mother of Army medic Jon, and Jennifer, sister of infantry soldier James, forge a friendship back home as their soldiers fight to stay alive in one of the most dangerous cities in Iraq. After meeting online, Patti and Jennifer joined forces to support their soldiers and comfort each other while their boys battled with the infamous Deuce Four Stryker Brigade in the fierce fight to secure Mosul, Iraq. Friends for Life: Strangers Brought Together by the War in Iraq is available for sale direct from the authors' website, http://www.FriendsforLifebook.Weebly.com, at Amazon.com, and through additional wholesale and retail channels worldwide. Jennifer MackInday lives in Bloomington, Indiana, with her husband and son. She attended Indiana University and has spent much of her career in advertising and marketing. Jennifer is a freelance writer and the owner of several successful enterprises. Patti Donahue splits her time between Amado, Arizona, and Sandy Island in Ontario, Canada. Patti has successfully balanced her family life and career as a corporate Director. Having worked more than 16 years in Mexico, she often describes herself as a true NAFTA woman. Friends for Life is her first published work.